Pray for: Botswana - Christians immersed in traditional nominal Christianity or syncretistic beliefs. For the largely unreached Bushmen of Botswana. For those suffering from the HIV epidemic. Botswana is another African country with a rich Christian history, some great leadership, and much better conditions than most of Sub-Saharan Africa. Please pray for revival among believers and improved ministry to AIDS sufferers. In the 19th century, LSM (London Society Mission) and the Wesleyan Methodist Missionary Society brought the gospel to the Tswana people and they converted rapidly to Christianity. Robert and Mary Moffat and David Livingstone from LSM were part of the outreach to the Batswana people, translating the Bible into their Setswana language in 1857. Livingstone also established the formal school near Gaborone, the capital of Botswana, in the 1840s. Through the support of indigenous chiefs such as Khama III, Christianity spread safely throughout Botswana. 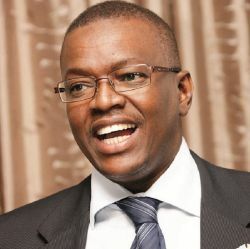 Khama III himself came to Christ in his early 20's through the work of the Hermannsburg Mission (Lutheran). He subsequently helped missionaries from LSM establish churches, installed Christian converts in his government, passed stringent laws against alcohol trade and banned a traditional manhood ceremony involving male circumcision and ritual sacrifice. The current president of Botswana is a descendent of King Khama III. Botswana was never colonized, but became a protectorate of Britain in 1885 at the suggestion of missionary John Mackenzie and through a request made to the British Crown by Khama and other chiefs. In 1964, his grandson, Seretse Khama, won independence from Britain to found the independent nation of Botswana. He immediately began efforts to transform his nation into an export-based economy, focusing on beef, copper and diamonds. The Orapa diamond mine was discovered only a few years later. It is now the world's largest, and Botswana supplies some 65% of the world's diamonds. Khama had the foresight to create strong protections against governmental corruption, market-friendly policies to promote trade, low and stable taxes, increased personal freedom. Having felt the sting of racism over his marriage to a British wife, courted during his education at Oxford, he opposed racism in his own country, just north of the Apartheid South Africa. As of 2005 there were 237 missionaries from 59 agencies from 18 countries ministering to the people of Botswana. About two thirds of the country is identified as Christian, with the remaining third mostly composed of traditional religious beliefs. (Animism/ancestor worship) The largest Christian groups are Anglicans, Methodists and the United Congregational Church of Southern Africa. Only about 19% of identified Christians attend church regularly. Another 20% profess personal faith in Christ, while 24% are traditional Christians in the Lutheran or Catholic Churches. Another 37% have some kind of private faith, but may trust in works, or combine other paths to God than the unique role of Christ. Traditionally in certain parts of the country, groups of people were essentially serfs, with few or no political rights, whose labor was compelled by citizens of the Tswana dominant group. These groups included Sarwa (Bushmen), Kgalagadi, and Yei in particular. In contemporary Botswana, these arrangements have no legal standing, yet lingering prejudices and resentments of historical inequities continue to inform current social relations. In 2011, Bushmen living in traditional hunting grounds in the Central Kalahari Game Reserve were relocated, ostensibly to preserve the wildlife refuge. Critics believe it is due to government interest in the diamond industry, as the hunting grounds included an area only 28 miles from the preserve which proved to be one of the world's richest diamond fields. Botswana's government is a parliamentary constitutional republic with a president, who is head of state and head of government, a unicameral legislative branch (parliament), the "National Assembly," and a High Court. The president is elected by popular vote, and may serve a maximum of two 5-year terms. 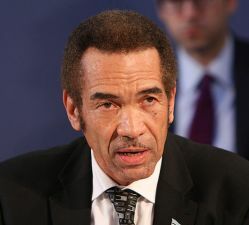 The current president, Ian Khama, is the son of Seretse Khama, the first president of independent Botswana, the grandson of Sekgoma II, the chief of the Bamangwato tribe as well as the great-grandson of Khama III, king of the Bamangwato people, who was a convert of Robert Moffat's London Missionary Society. Botswana's constitution guarantees freedom of religion. However, all organizations, including religious groups, must register with the government. A 2006 demographics report showed that 63% of Batswana are members of Christian groups, 27% claim their religion as “God,” 8% claim no religion, and 2% adhere to the traditional indigenous religion Badimo. All others comprise less than 1% of the population. Anglicans, Methodists, and members of the United Congregational Church of Southern Africa make up the majority of Christians. There are also Lutherans, Baptists, members of the Dutch Reformed Church, Mennonites, and members of other nominally-Christian denominations. According to a 2011 study by the Pew Research Center, there are approximately 8,000 Muslims, many of whom are of South Asian origin. From humble beginnings as one of the world's poorest countries before its independence in 1966, Botswana has developed one of the fastest-growing economies in the world. For the past four years, it has been given the highest rating in all of Africa on Transparency International's relative index of perceived corruption. It also has the fourth-highest gross national income in Africa, the highest Human Development Index in continental Sub-Saharan Africa, and an estimated GDP per capita of US $18,825. Business regulations are flexible, and entrepreneurship is encouraged. Major industries are agriculture, industry (over 52%, including 36% from mining), and service (46%). Half of the largest diamond mining company is government-owned, and the mineral industry produces 40% of all government revenue. The world's largest diamond mine is located in Botswana, and is estimated to have produced $1.6B of diamonds in 2013. 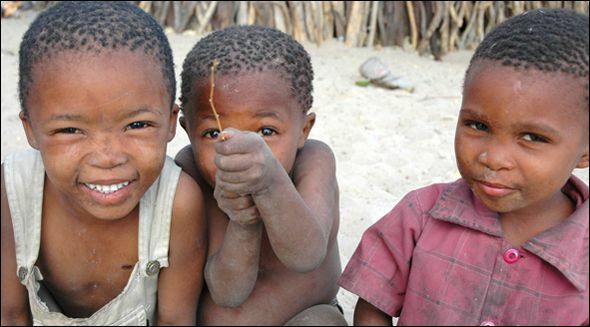 As of 2008 about 83% of Botswana's total population (15 years of age or older) were literate. School attendance is compulsory between the ages of 7 and 15. Ensuring compliance is difficult, as many students live in remote areas or are employed in family businesses. Students are taught in Sestwana language for the first four years, then they transition to English. Despite the AIDS crisis, only 5.4% of the GDP is spent on healthcare, and there are 38 physicians per 100,000 population. 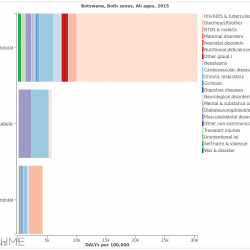 The IHME mortality chart for Botswana reveals that HIV/AIDS and tuberculosis far outpace other mortality factors. Botswana is in the center of southern Africa's HIV/AIDS crisis, with the second highest prevalence in the world. (17.6% of the general population and 24% for ages 15 and above, 49% of women aged 30-34 years, including over 33% of expectant mothers, by 2017 estimates.) An estimated 60,000 have been orphaned by the disease. 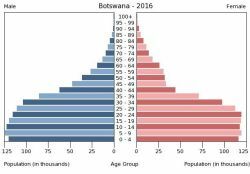 According to the CIA World Factbook, The life expectancy in Botswana is 54.5 years, declining from a high of 65 in 1990 to as low as 35 years in 2005, due to the AIDS crisis. The Kalahari Desert comprises over 3/4ths of Botswana's total land area. Desertification is a serious environmental concern and is said to be caused by livestock overgrazing. The climate is semiarid, with warm winters and hot summers. It borders Namibia, South Africa and Zimbabwe. In 2016 GMO recorded 123,398 gospel visits, 19,033 indicated decisions and 18,238 discipleship visits from Botswana. We currently have no Online Missionaries, but Kennedy Olebile Baikalafhi served with us in 2016, and Alexandra Mwaura was with us until 2015. Please continue to pray for daugher Emily, doing 3 summer semesters and learning how to best manage her own health following her diagnosis of Ehlers-Danlos Type III Hypermobility Syndrome. Please keep prayin for John - it's like he's in seminary while he’s incarcerated. Hope he’ll sustain that when he gets out. No dates. He'll be going in on June 19 (Tuesday) for trial. Relating very well to Frank & Martha. Doing a lot of studying. Frank’s over 11K contacts with GMO now! Please continue to pray for her. She was moved to rehab last week after her brain hemorrhage. She did make it to AZ and is staying with her daughter. Her daughter is a home healthcare nurse and is up at 5AM with very flexible hours, so she's not sure when/if she'll be able to join us. Please pray for their time together and for Barbara's health. Please continue to pray for his brother Jamel. There have been no changes in his condition.